Lonely single Christians in this world need not be ashamed of their state in life. God has a grand purpose for your singleness, so it ought to be of gladness and joy instead of sorrow and/or shame. This has such a bad connotation in that the term denotes someone who goes around feeling sad, good-for-nothing, desperate, or being a bit down on him/herself, wondering if love will ever come. Ever felt that way? I certainly have, and I'm sure many other Christian singles have too--at least sometime in their lives. There are tons of single believers just like you who are searching for the answer to loneliness but do not know quite how or where to look. I would suggest that you first look to God's Word. His instruction book will give you all the answers you need in order to live and walk according to His will and purpose for your life, regardless of being single or married. You see, the reason you are not truly alone is because God is with you in all things! I'm sure you have been told this or heard it from time to time, and it might seem like it's just a cliche to you, but it is the absolute truth. And for a Christian single it can be extremely comforting to know that you have a heavenly Father, who is with you always in His presence, and who loves you more than you could ever love anyone else, or yourself. Psalm 16:11 says, "Thou wilt shew me the path of life: In Thy presence is fullness of joy; at Thy right hand there are pleasures for evermore." Exodus 33:14 says, "And He said, 'My presence shall go with thee, and I will give thee rest." Jeremiah 29:13 says,"And ye shall seek Me, and find Me, when ye shall search for Me with all your heart." Psalm 25:5,9 says,"Lead me in Thy truth, and teach me: for thou art the God of my salvation; on Thee do I wait all the day. The meek will He guide in judgement; and the meek will He teach His way." Psalm 145:18 says, "The Lord is nigh unto all that call upon Him, to all that call upon Him in truth." Isaiah 55:6 says, "Seek ye the Lord while He may be found, call ye upon Him while He is near..."
Just because you are alone in the world does not mean it's the end of the world. Many times we can grow desperate just to have a little bit of love and happiness in our lives, only to find ourselves getting involved with people we should not be involved with or putting ourselves in compromising positions which may cause us or another person to fall into sin. I too fell into this trap a few times many years ago while in college as I was beginning to feel sorry for myself, looking for love in all the wrong places and dating a few of the wrong people whom I knew were not Christians. I told myself I could convert them and then they would see things as I saw things--in a more spiritual light. How wrong that was! I soon learned quickly that my way was not working out too well, and that God would not ever give His blessing upon it either. Gain a rightful attitude. Beating myself up about being lonely was not going to help the situation improve at all, so I just decided to change my thinking about it and, with God's help, learn to accept my state in life as it was for the moment. The Bible tells us these things: Ephesians 4:31 says, "Let all bitterness, and wrath, and anger, and clamour, and evil speaking, be put away from you, with all malice..." Also in 1 Peter 5:7 it says, "Casting all your care upon Him; for He careth for you." Furthermore, in 1 Timothy 4:10 it tells us, "For therefore we both labour and suffer reproach, because we trust in the living God, who is the Saviour of all men, specially of those that believe." And then to help my thought process, I look to this verse: Philippians 4:8 which says, "Finally, brethren, whatsoever things are true, whatsoever things are honest, whatsoever things are just, whatsoever things are pure, whatsoever things are lovely, whatsoever things are of good report; if there be any virtue, and if there be any praise, think on these things." Look only to God; trusting Him, for what I need and want in my life. Sometimes this is easier said than done when there are so many temptations and diversions out there in the world to turn my head otherwise. But I found that in seeking only what the Lord wanted for me; ultimately, His desires became my own true desires as well. That to me, is the beauty of waiting on the Lord for what you need and want. You may find it also helps in taking you out of your loneliness. Through prayer and scripture you will find this to be true for you as well. These verses demonstrate that, such as in: Deuteronomy 4:29, which tells us, "But if from thence thou shalt seek the Lord thy God, thou shalt find Him, if thou seek Him with all thy heart and with all thy soul." Also, in Proverbs 8:17 it says, "I love them that love Me; and those that seek Me early shall find Me." Moreover, in Matthew 6:33 it reminds us, "But seek ye first the kingdom of God, and His righteousness; and all these things shall be added unto you." And in Matthew 7:7-8 it says, "Ask, and it shall be given you; seek, and ye shall find; knock, and it shall be opened unto you: For everyone that asketh receiveth; and he that seeketh findeth; and to him that knocketh it shall be opened." Also, in Lamentations 3:25 it tells us, "The Lord is good unto them that wait for Him, to the soul that seeketh Him." Also, in Proverbs 3:5-7 it says, "Trust in the Lord with all thine heart; and lean not unto thine own understanding. In all thy ways acknowledge Him, and He shall direct thy paths." And, finally, in Psalm 37:4 it says, "Delight thyself also in the Lord: and He shall give thee the desires of thine heart." Have faith in God, trusting in His promises. This has been a personal challenge for me in my walk with the Lord. Whenever I only looked at my present state of affairs, the outcome would seem a bit daunting to me. Sometimes we believe and perceive life only through what is on our present radar screen and can become easily deceived by our feelings and emotions. They are of the flesh and so we must not count on them to get us through a tough situation. Having faith in God and trusting in His promises help us to overcome the doubtful feelings and emotions that can plague us from time to time. These scripture verses have helped me in this regard too: Philippians 4:19 says, "But my God shall supply all your need according to His riches in glory by Christ Jesus." And in 1 Peter 1:3-5 it says, "Blessed be the God and Father of our Lord Jesus Christ, which according to His abundant mercy hath begotten us again unto a lively hope by the resurrection of Jesus Christ from the dead, To an inheritance incorruptible, and undefiled, and that fadeth not away, reserved in Heaven for you, who are kept by the power of God through faith unto salvation ready to be revealed in the last time." Also in Romans 8:28 it says, "And we know that all things work together for good to them that love God, to them who are the called according to His purpose." 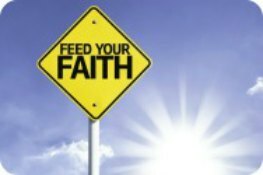 Also in Hebrews 11:1,6 it tells us, "Now faith is the substance of things hoped for, the evidence of things not seen. But without faith it is impossible to please Him: for he that cometh to God must believe that He is, and that He is a rewarder of them that diligently seek Him." Furthermore, in 2 Corinthians 1:20 we find, "For all the promises of God in him are yea, and in Him Amen, unto the glory of God by us." And finally, in Jeremiah 29:11 we rejoice in knowing this, "'For I know the thoughts that I think toward you', saith the Lord, 'thoughts of peace, and not of evil, to give you and expected end.'" So, dear single Christian friend, please let me remind you that although you may feel or be lonely in this life, you are never really alone. God has you in the palm of His hand and He knows your plight. His eyes are on you continually and He knows why you are where you are today. Your situation may change soon, or later down the road. Whatever the case may be, might I just suggest to you; seek His face in continual prayer and supplication, walk with Him on a daily basis, study and meditate on His word, and trust Him with everything. My prayer for you is that in doing all of this, you will forget your loneliness but rejoice in being alone with God and He will reveal Himself to you in some way, giving you the true desires of your heart. May God Bless you.